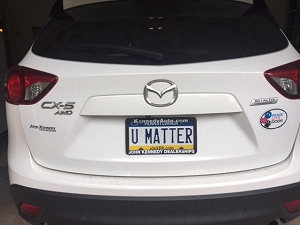 This is a wonderful week for our Marathon as all domestic You Matter cards are going from my home and heart to yours! International cards are already in the mail thanks to Helen Travis, our UK YuMMie, and Jaime Cundy, our Canadian YuMMie. We are grateful for the most recent radio interviews with: Sister Jenna on American Meditating Radio, City Councilman David Oh, and, KYW News Radio. The YMM now has 17,119 participants, and 137 Ambassador organizations from all 50 states, and 23 countries. Some new Ambassador organizations include: Clear Creek Independent School District, Galilee Missionary Baptist Church, and Valley Humane Society. Feel free to post a photo or note on our Facebook page when you receive your cards. If you want to give out more than 30 cards during November, click here to purchase You Matter cards (try using discount code THANKS20), or print your own cards using this template.